Great guy to do business with! He's always right on time, and goes out of his way to make sure your happy! 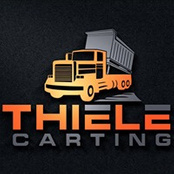 We use Thiele Carting on a regular basis and we always have excellent service. Charlie always communicates with our customers prior to placing dumpsters and makes sure the driveway is protected from damage. Of all the roll off services in the area we have worked with, Thiele is the best by far! Great people to work with. Would definitely do it again. Great local small business to work with. Prompt, honest, ethical and one of the most skilled operators iv met. Always a pleasure working with them! Great service. Highly recommended for anyone in need of garbage or household removal! Excellent prices as well !! I will be using this service again. I've been a customer for both plowing and dumpsters on several occasions. Dependable, flexible and reasonable prices not to mention friendly and willing to go almost anywhere. I highly recommend Charlie Thiele and suggest using them to all my friends.